I was over at the workbench this afternoon working on some Direct Conversion receiver ideas. 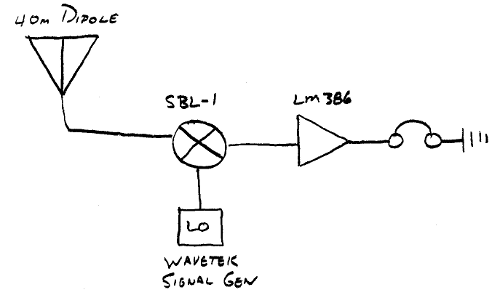 My original plan was to use a NE602/SA612 with my signal generator and a LM386 op-amp. It is not designed to be a incredible piece of hifi gear, but the hope was that it would be quick and dirty receiver. For what ever reason I seemed to struggle with the SA612 on the breadboard. The LM386 provided audio but the SA612 did not seam to want to act like a mixer which is a problem. After screwing around for a while I decided to take an even simpler approach, use the trusty SBL-1 as a passive mixer. --Bingo, 2 minutes of setup and I was hearing CW on the computer speakers. The audio clip sounds pretty poor as it was just a computer mic near the speaker. The person calling CQ was very easy to follow so the breadboard mess was functioning as a direct conversion receiver. When time permits I would like to go back to the workbench and figure out why I was having problems with the SA612... it should be really simple... but clearly it wasn't. The DC receiver is not long for this world, it is a stepping stone as I begin to work through receiver theory and more complex designs.